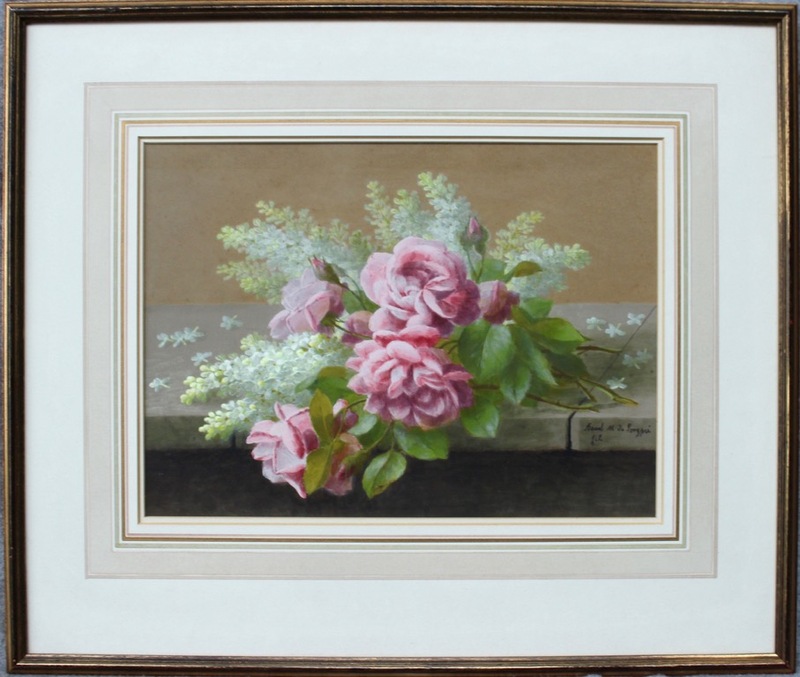 A Very Impressive Framed French Gouache on paper, by Listed French Still Life Artist Raoul Victor Maurice Maucherat De Longpre offered complete within its later mount and frame. Last quarter of the Nineteenth Century. Stunning Bouquet of cut Pink Summer Roses with Gypsophilia resting on a ledge. 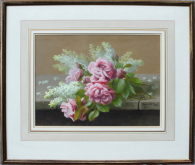 Condition: Good clean original condition with no foxing, recently removed from frame and professionally re-mounted, painting is glazed. 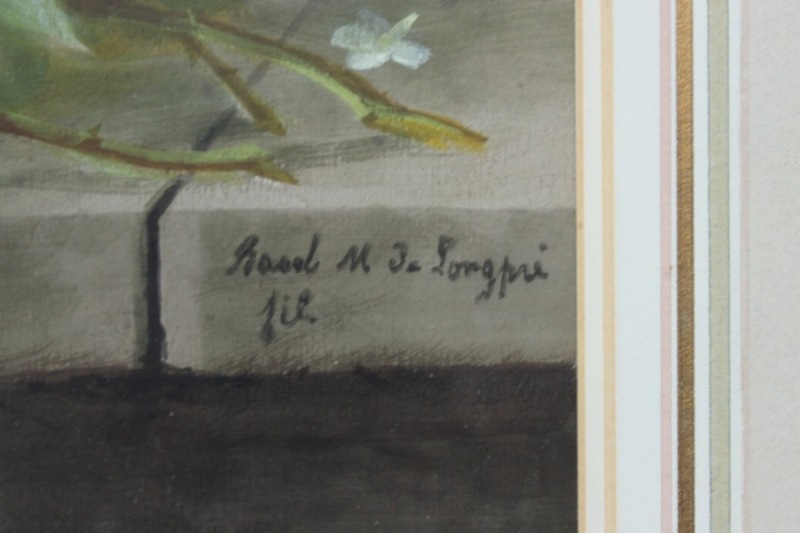 Signed lower right as shown. Height: (entire including frame) 18” (46m). Width: (entire including frame) 22” (56cm). Raoul Victor Maurice Maucherat de Longpré was a masterful painter whose floral still lifes combine botanical accuracy with artistic acumen. Born in Paris on 2nd December 1843, the son of Jean-Marie-Antoine-Victor and Marie-Thérèse née Pinchaud de Longpré, he came from a strong artistic family whose younger brother Paul Gaston (1855-1911) also distinguished himself as a floral painter. Paul had been born in Lyons, where Raoul also grew up and absorbed the floral tradition that was so closely tied to the town’s textile design industry. Showing an early talent, from the age of 12 Raoul de Longpré began painting flowers on fans for a Parisian based company. 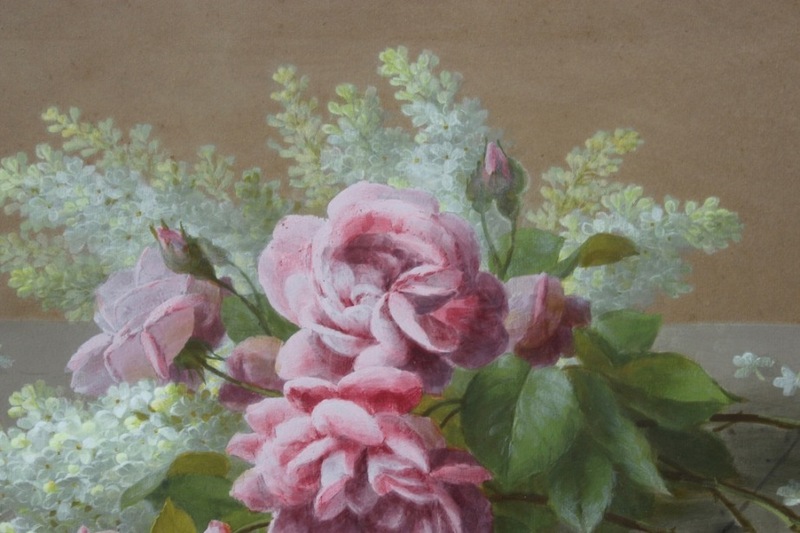 From this and from his close observation of botanical studies he went on to produce works of exquisite detail. His subject matter evidently reflected his awareness of ‘the language of flowers’, a coded means of communication popular during the nineteenth century. For instance white lilacs signified youthful innocence, whereas purple lilacs symbolized the first emotion of love. 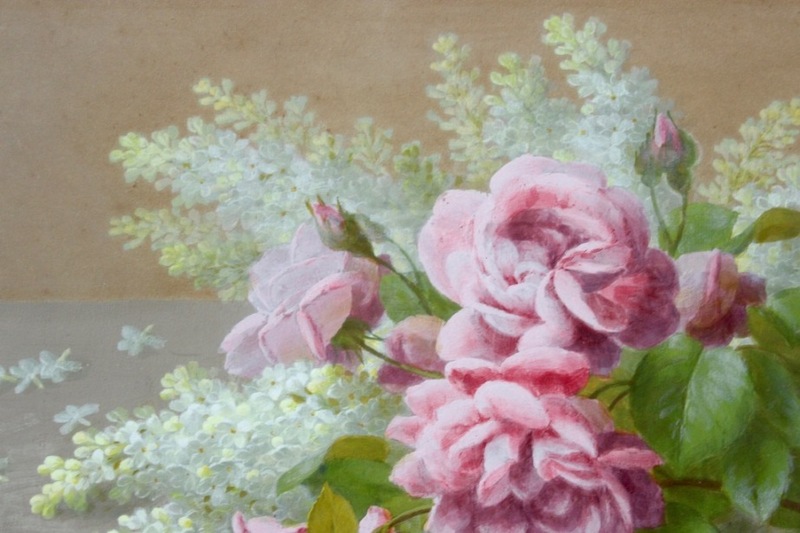 Roses had a multitude of meanings dependent upon what other flowers they were combined with. 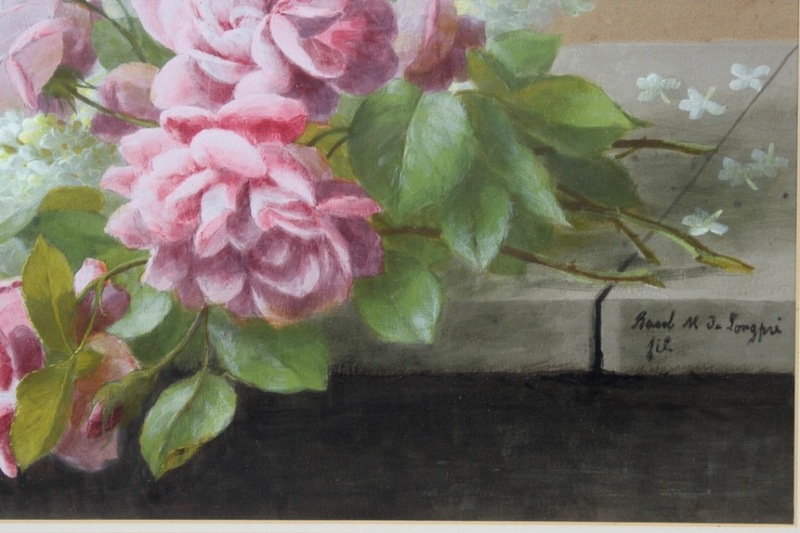 As here with this example we are offering de Longpré’s compositions focus specifically on the blooms rather than how flowers might appear in their naturalistic habitat, thus reinforcing his interest in them as allegorical devices. 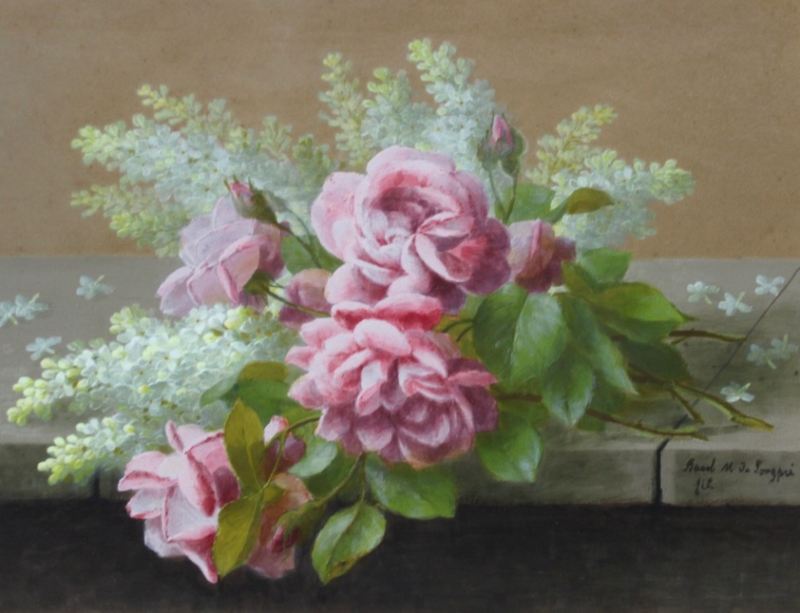 Raoul de Longpré’s work has a depth of space and richness of colour while his preference for gouache and watercolour as a medium always gives a vitality and freshness to his outstanding creations.